Property 4: Brooklyn Brownstone rental. Property 6: ** Spring Special**Private floor is yours in beautifully restored brownstone! Property 9: Home away from home ..
Property 21: Charming and Spacious Garden Apt. 2 Stops from Midtown! Beach Front,Ideal for family and couples,beautiful place for sunset lovers!!!!!! Property 36: Beach Front,Ideal for family and couples,beautiful place for sunset lovers!!!!!! Property 40: LA MAISON DES SIRENES 1, 20mn away from city. Come and live like a New Yorker! 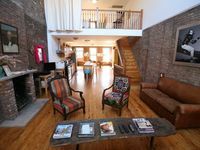 Property 42: Townhouse in Heart of West Village, Walk to All! Cozy Private Room Near JFK Airport. Property 43: Cozy Private Room Near JFK Airport. Property 46: Spacious 4br/2.5 Bathroom Duplex, 3 Min From Midtown Manhattan! Property 50: Stunning West Village 3 Floor Townhouse - Your NYC Home! This was a spacious and well- located rental for our 3-generational group including girls 10 and 12. It was an easy walk to the 2 and 3 train which got us to all the spots we wanted to visit. There are a lot of stairs involved in the townhouse, so everyone needs to be in shape. Markets are close by, as is a great restaurant-Tio&rsquo;s. We reserved a garage a couple of blocks away on Lenox so our car was out of our way and safe. We felt safe walking all around the area. Had the 2nd floor of a nice brownstone. Very clean....nice remodeled bathroom...very comfy bed....on street parking was not a problem. Richard and LuLu are great hosts, very friendly. Nice breakfast each morning with some sort of danish and ample amount of delicious fruit. She even left a water for us each day when we left. Milk and juice left in small fridge for us. Even a nighttime snack waiting for us when we got back each evening. I love the chalkboard in the entry that allows notes to be left for each other, making communication a breeze if your schedules are not compatible. Even greeted us with a fresh baked cookie and real hot chocolate when we arrived. Next time we visit our daughter, we know where we are staying. Thanks!